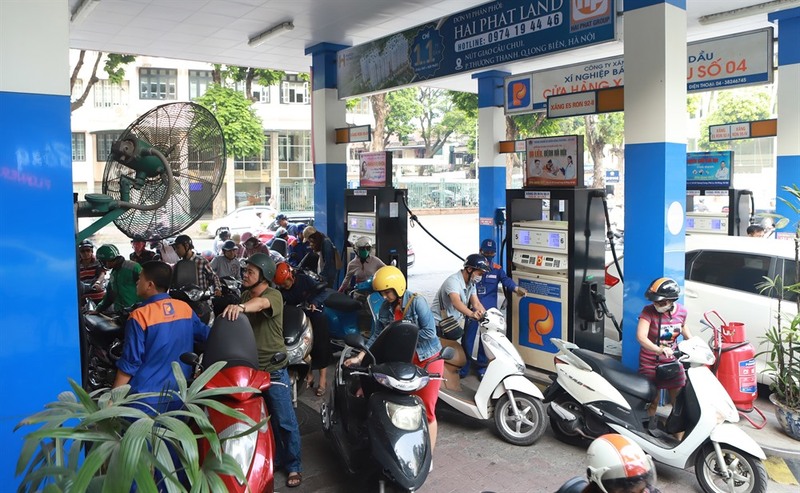 HÀ NỘI — The petrol retail price saw its highest surge so far this year on Saturday, raising concerns over unpredictable impacts to the economy and the possible increase of goods prices during the upcoming Tết (Lunar New Year) Holiday, experts said. The ministries of Industry and Trade and Finance raised the retail price of biofuel E5 RON 92 by VNĐ675 to VNĐ20,906 per litre. The price of RON 95 also rose by VNĐ577 to VNĐ22,347 per litre, while the prices of diesel and kerosene went up by VNĐ485 and VNĐ403 to VNĐ18,611 and VNĐ17,086 per litre, respectively. The price of mazut increased by VNĐ752 to VNĐ15,964 per kilo. According to the ministries, global oil and petrol prices surged to US$90.63 a barrel in the past 15 days. If the price of crude oil climbs to $100 a barrel by the end of this year, the country will have to consider action to stabilise prices. Earlier this year, the National Assembly approved important goals such as growth rate and inflation based on the scenario of the crude oil price staying at $50 a barrel. The surging price in the world market will thus certainly affect the economy. On the positive side, rising oil prices will increase revenue for the State budget through the sale of crude oil. However, the benefits from the sale of crude oil to the economy at this time are not as great as before 2014 because the Government has taken into account sustainable growth scenarios independent of oil prices. In fact, crude oil production is falling, from 17.23 million tonnes in 2016 to 15.52 million tonnes in 2017. However, former head of the Central Institute for Economic Management Dr Lê Đăng Doanh said the most daunting impact was the pressure to increase domestic retail prices, thereby reducing competitiveness, threatening inflation in the economy and causing people’s actual income to fall. Nguyễn Đức Độ from the Academy of Finance said the CPI would be under control and remain less than 4 per cent, as set by the National Assembly. However, rising petroleum prices would have a direct impact on people’s spending, causing inflationary pressures through 2019. Experts said some products such as food, cosmetics and packages saw a price increase before the petrol price hike due to the increasing input of labour cost, material and exchange rate. There would be a new surge in the future because of the petrol hike. Lê Thị Thanh Lâm, deputy general director of Sài Gòn Food JSC, was quoted by Lao động (Labour) Newspaper, saying that their company has striven to keep their products’ prices stable. However, they will have to increase their prices for the upcoming Tết holiday. The continuous increase in petrol prices would not only affect the cost of transportation, but also increase the input costs. Manufacturers are worried that prices have been locked in for the Tet holiday but that they could apply for adjustments in early March 2019. However, the company must consider only reasonable increases because the price increases always accompanied with purchasing power reduction, Lâm said.